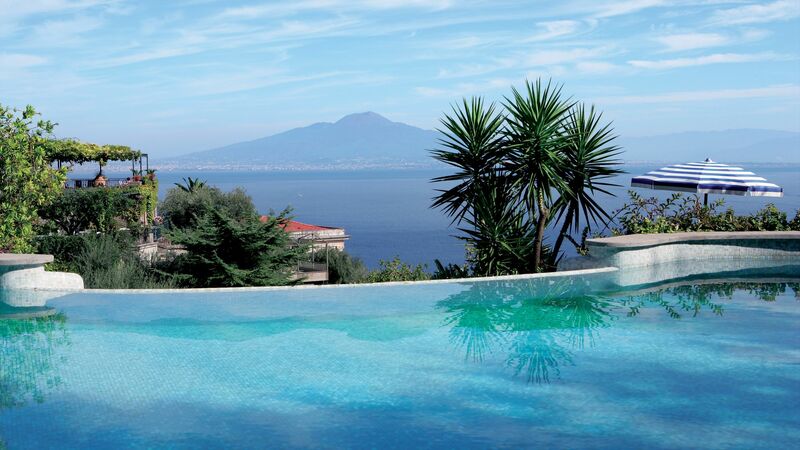 The Grand Hotel Capodimonte is a traditional hotel that sits amongst terraced gardens on a hillside above Sorrento, enjoying superb views across the town to the Bay of Naples and Mount Vesuvius. Sorrento's bustling centre is just a ten-minute walk away yet the pretty, shaded terraces that surround the hotel's cascading swimming pool provide the perfect place to enjoy a relaxing day. 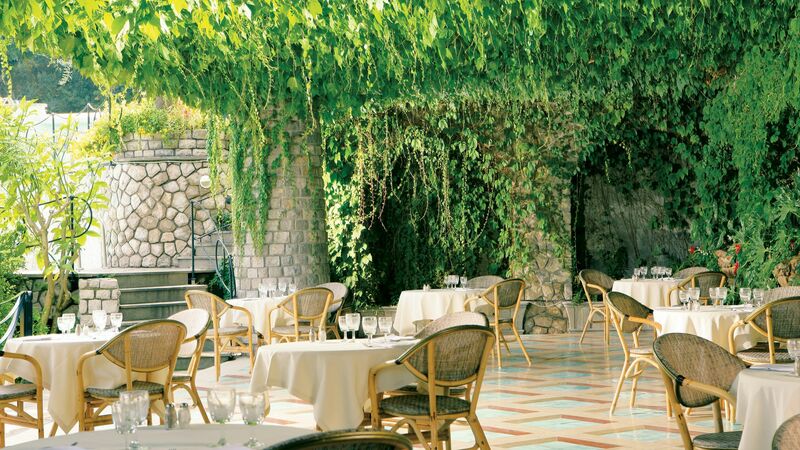 A poolside restaurant is on hand during the summer months, serving light cuisine for lunch. 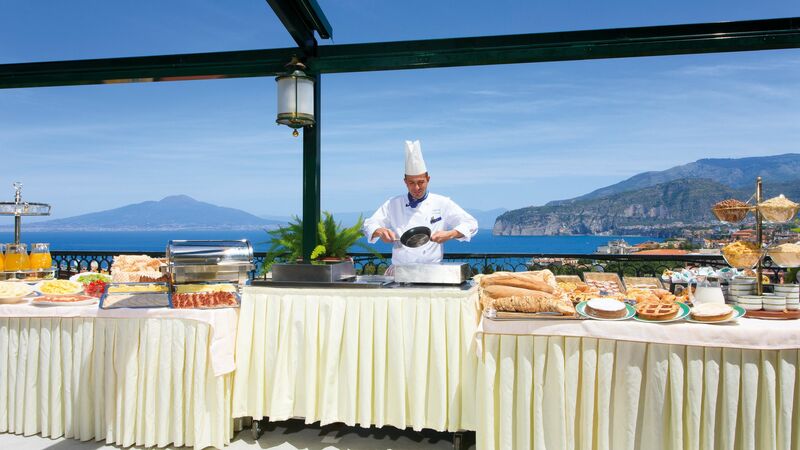 Dinner can be enjoyed on the terrace of Ristorante Le Querce, which offers panoramic views of the beautiful coast. Comfortable guest rooms have been finished in a traditional style, with local Vietri tiles used for the flooring, and the hotel's tranquil atmosphere makes it an ideal base for a relaxed holiday. This restaurant offers a delightful view of Sorrento and the Bay of Naples and serves a wide range of typical Neapolitan and international dishes. Serves local and international dishes on the terrace during the summer months. 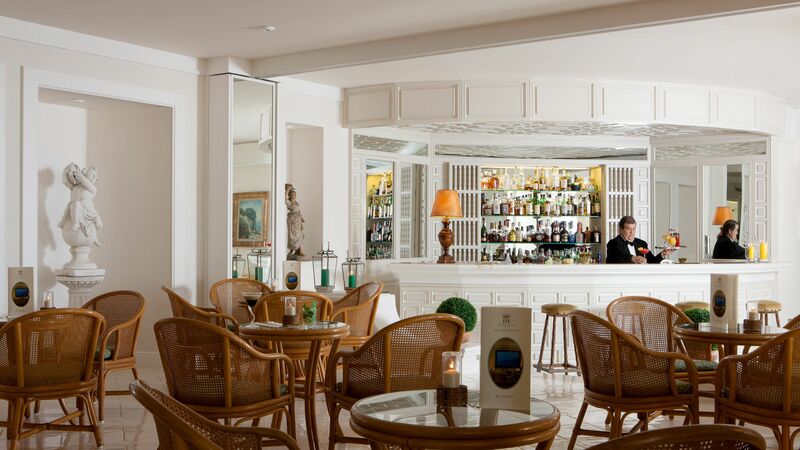 Enjoy a drink at this comfortable and sophisticated bar. Overlooking the cascading pools, this bar serves informal barbecued lunch and cool drinks. The hotel features a stunning set of five cascading pools, with incredible views of the rolling hills covered in olive and lemon trees. From its prime clifftop position, Sorrento has wide-angle views across the Bay of Naples to Mount Vesuvius. Palms and citrus groves cluster around grand villas and elegant hotels, and along the spaghetti-thin lanes of the old town you’ll find tiny trattorias and a generous helping of shops (bottles of limoncello, brightly painted ceramics and bespoke sandals are all must-buys). The main square, Piazza Tasso, is the place to head for a morning espresso, while the waterfront Marina Grande is the ideal spot for a dinner of freshly netted seafood. Sorrento’s location also makes it the perfect springboard for exploring more of the Neapolitan Riviera. Amalfi Coast towns like Positano and Ravello are in easy reach, as are the ruins of Pompeii and Herculaneum. Hop on a boat, meanwhile, and you can skim over to the islands of Capri and Ischia. Single Rooms have classical and elegant interiors in soft pastel colours and wooden furniture. All rooms include individually adjustable air conditioning and heating, satellite TV, minibar, complimentary Wi-Fi, telephone, radio, safe, bathtub with overhead shower and hairdryer. Twin Rooms are spacious with classical and elegant interiors in soft pastel colours and wooden furniture. All rooms include individually adjustable air conditioning and heating, satellite TV, minibar, complimentary Wi-Fi, telephone, radio, safe, bathtub with overhead shower, hairdryer and a balcony. Twin Rooms Parcial Sea View are spacious with classical and elegant interiors in soft pastel colours and wooden furniture. All rooms include individually adjustable air conditioning and heating, satellite TV, minibar, complimentary Wi-Fi, telephone, radio, safe, bathtub with overhead shower and hairdryer. The rooms have a balcony with partial sea view from the balcony. Twin Rooms are spacious with classical and elegant interiors in soft pastel colours and wooden furniture. All rooms include individually adjustable air conditioning and heating, satellite TV, minibar, complimentary Wi-Fi, telephone, radio, safe, bathtub with overhead shower and hairdryer. The balcony boasts views over the sea and Sorrento. 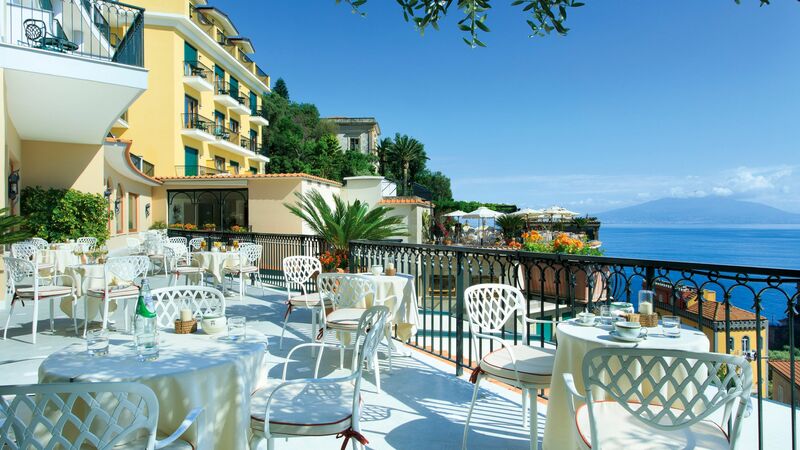 Hotel guests receive a 10% discount at Il Parrucchiano restaurant in Sorrento for holidays between 01 April - 31 October 2019. I really liked this Hotel, the rooms were super clean, the location was very good, the Hotel itself was very pretty. The included breakfast was very good, LOVELY bread! Overall very good value for money, the staff were very attentive. The only downside was the price of the drinks, I guess that is the same all over Sorrento. Do not order the coffees, very poor value, horrible coffee and straight out of a machine by the taste (outside of the breakfast which was good). The location is excellent, 5 minutes from the start of the pedestrianised area. We stayed here for our honeymoon and loved almost all of it. Firstly the hotel staff are lovely and very helpful, there's no denying that! The pools looked awesome and we would have swum had it not been 13 degrees Celsius and raining... The bed was super comfy and large, the balcony was small but perfect for a couple to sit out on, and the bathroom had a bath/shower that was nice and deep and relaxing (though no view). The hotel is a bit of a maze, as it's built into the cliff, however it's easy enough to get around via lifts or stairs, and there are multiple places to sit/relax/drink/eat. It's also really close to town, only being a 5 minute walk from the main street and less than 20 to the station (easy access to Naples/Pompei etc). You can also walk out the other way to the hills and coast, though this is usually on the road. We stayed half board which meant breakfast and lunch or dinner. The buffet breakfast was plentiful and had a good selection. The lunch is up at the "bar" by the pool, and we felt it wasn't worth the money (looking at menu prices). Dinner was 3 courses (first 2 changed options daily) and almost everything we ate was delicious (saffron risotto was a bit bland for example). What let dinner down was the service. Day 1 we had to wait 10 minutes to simply get a menu, and then another 15 to finally order. We understand that they were busy, however it appeared that some tables were being favoured over others. The next few nights we ate earlier and felt the complete opposite, as if we were rushed through (menus thrust onto us and a waiter coming to take our order in under 30 seconds). It might be overly critical but considering the service we'd had elsewhere in Sorrento and for a 4 star hotel, it wasn't fantastic. Finally our biggest issue was with the price of drinks. A bottle of water will set you back 5 euros, a beer 7 euros, and a small bottle of wine (250ml) 8 euros. The cheapest bottle of wine they had was 19 euros which wasn't bad, but considering supermarkets sold the same bottle for 3.50, it's quite the markup. This was why we ate earlier and headed out to bars in Sorrento for drinks after dinner instead, as the same 20 euros would get you twice the number of drinks and usually better quality. Overall we loved the hotel and would stay again, but likely only B&B as half board didn't quite cut the mustard. There are some great restaurants and bars in Sorrento itself, which would cost you less than the hotel. We booked a standard double room rather than one with a sea view as we were told the views were stunning from the bar and pool areas anyway. On arrival you take a lift up to reception and check in was friendly, swift and without fuss. You then walk along a long, tiled corridor which is a tunnel under the pool and bar areas to the main buildings with the rooms. You then take an elevator up to your floor. Our room was right at the end of the winding 8th floor corridors. It was a spacious and airy room, with tiled floors. There was a faint smell of fresh pains suggesting it had just been re-furbished. The bed was actually two singles joined together making a very comfortable super-king. There was a seating area with table and chairs, plenty of wardrobe and drawer space and a large clean bathroom with a bath, large sink and the usual bidet, plus a powerful, hot, over bath shower. There is a hairdryer in the bathroom too. There is a safe in the room which includes an internal power socket so you can charge your tablet or phone whilst it's safely stored. Safe had plenty of room for a laptop also. The patio doors opened onto a large patio with lush tropical gardens front and right. To the left there is a view across Sorrento and the sea, with Vesuvius in the distance. The hotel staff were friendly and all spoke good English, but appreciated us trying to speak Italian. We only ate once on arrival at the pool bar and had a nice pizza. There are several restaurants and bars, all with stunning views. We didn't use the pool as it was too cold in early April. From a location point of view, the hotel is just up the hill from the town, about a 5 minute walk and 15-20 mins down to the Marina Grande with its restaurants and bars. To get down there, don't follow the road as it's not a good route and longer. Head into the town then take one of the paths on the left behind the hospital. We pre-booked airport transfers with Sorrento Cars for ?? ?160 return. Great service in a Mercedes which took about an hour door to door. We took the Circumvesuviana train to Herculaneum one day and it was very slow, hot and busy, so I wouldn't recommend this as a route to/from the airport.